Population growth and resulting urban sprawl continue to gallop across and gobble up California’s and America’s productive farmland. President Donald Trump’s 2018 budget request contains good news for American workers. I have been a member of the CAPS Board of Directors for many years; in January I was privileged to become President of CAPS. For years, the press helped blur the distinction between American citizens and those who staked a claim to live in the U.S. without any legal authority. This is an overview of calendar year 2016 activities and results from CAPS. To request the full annual report, with financial statements and media coverage summary, call 805-564-6626 or email info@CAPSweb.org. A change in the administration is not enough to implement the immigration reductions that America needs. Population growth and resulting urban sprawl continue to gallop across and gobble up California’s and America’s productive farmland. Arable lands with good soils and adequate water that can produce food sustainably are one of our greatest natural resources and economic assets. The American Farmland Trust (AFT) reports that more than 40 acres of farm and ranchland are bulldozed and paved every hour in the U.S. – at a rate of nearly a thousand acres a day. It is a level of loss that is as unsustainable as it is alarming. In California, in the three decades between 1982 and 2012 alone, newly developed land sprouting subdivisions and strip malls sprawled across an additional 3,400 square miles (2.2 million acres) of open space. If each of these 2.2 million acres – in the shape of a square 209 feet on a side (about the area of a football field) – were placed end to end, they would stretch three times across the United States all the way from the Pacific to the Atlantic. All of this developed land was either farmland or wildlife habitat, or both, representing an incalculable loss of potential food production and ecological functions. According to the AFT, about half of America’s protected wildlife species depend on private working lands for 80 percent or more of their habitat. In the same period (1982 to 2012), California’s already swollen population grew by an additional 13 million – from 25 million to 38 million. 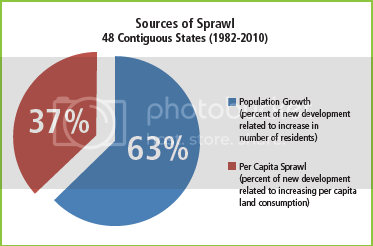 This increase in the number of California residents – each of whom consumes land for housing, workplaces, schools, transportation, commerce, utilities, and other built-up land uses – accounted for more than 90 percent of the sprawl. Hyper-populated California is far from unique. 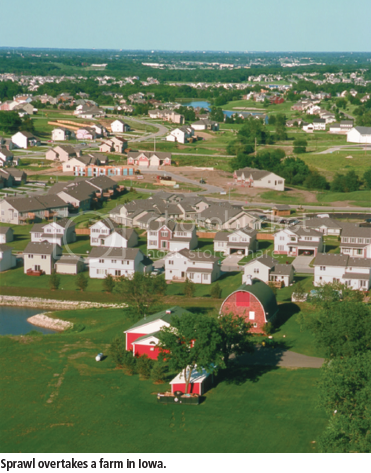 Using data from the U.S. Department of Agriculture, a 2014 study by NumbersUSA found that on average, between 1982 and 2010, 63 percent of the sprawl in the Lower 48 States was related to population growth, while just 37 percent was attributable to increasing per capita land consumption (for larger houses and yards, etc.) or decreasing population density. Yet a popular misconception persists that the chief villain behind sprawl is the bottomless appetite of greedy, gluttonous Americans for ever larger “McMansions” and “Downton Abbey”-style estates. This misguided, politically correct caricature ignores the true culprit in contemporary sprawl: unending, mounting immigration-driven population growth. If current trends continue, the outlook is ominous for farmland and food security. 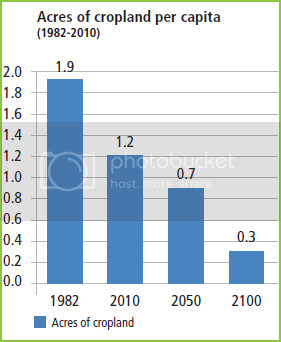 The chart below shows the projected long-term decline in cropland per person from 1982 to 2100. By 2100, if current population growth and cropland loss trends persist, there would be just 0.3 acre of cropland per capita compared to 1.9 acres per capita in 1982. It would take a technological miracle to increase crop yields (production per acre) sixfold to compensate for this decline in cropland per capita, especially in view of the additional challenges of erosion, soil fertility declines, diminishing returns on fertilizers and pesticides, climate change-induced soil moisture stress, and reduced availability of fossil fuels for fertilizer and water for irrigation. Not even Nobel Laureate Norman Borlaug, “Father of the Green Revolution,” believed that infinite innovation in agriculture could outrun infinite population growth. A key, if neglected, element in safeguarding our farmland and our long-term food security is stopping the population growth and sprawl that undermine them both. President Donald Trump’s 2018 budget request contains good news for American workers. Included in the budget is a $15 million set aside for E-Verify improvements as the president pushes to have the online work eligibility verification system become mandatory during the next fiscal year. Before E-Verify can become mandatory, however, Congress, which has put up road blocks in past years, would need to include President Trump’s request in its final budget, and then pass a law to make it compulsory. Previously, three E-Verify bills have been introduced in the House and one in the Senate, but none has advanced, possibly because congressional leadership feared a veto from former President Obama. But with Republicans controlling the House, the Senate and the White House, E-Verify should sail through. Legislators opposed would be sending a message to their constituents that they favor hiring illegal immigrants ahead of American citizens or legal permanent residents, an untenable position. In 2013, a Bloomberg Government study confirmed E-Verify’s effectiveness. The independent report, “Early Evidence Suggests E-Verify Laws Deter Hiring of Unauthorized Workers,” found that in states where E-Verify is mandatory, a shift toward legal workers became quickly evident, even in employment sectors normally dominated by illegal immigrants, including apparel manufacturing, commercial bakeries, and taxi and limousine services. Senate Judiciary Chair Chuck Grassley recently introduced S 179, a mandatory E-Verify bill. Please urge your senators to support it. Go to the CAPS home page, click on the “Take Action” tab and sign the “ACTION ALERT” - Tell Senate to pass S 179, mandatory E-Verify! 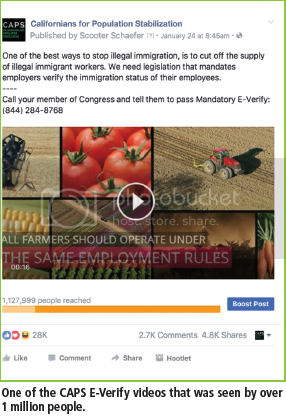 CAPS is further supporting the push to mandate E-Verify with an online video campaign. Initially I was attracted to CAPS because of my love of the environment and of my long-standing concern for the welfare of poor Americans. When I was only a teenager I could already see that unchecked population growth would be harmful to both the environment and to the poor. Unfortunately, during my lifetime U.S. population has more than doubled – with no end in sight. In California the population density (people per square mile) is already larger than in the continent of Europe. With business as usual growth, in but about another 40 years California’s population density will surpass that of China. This is the same China that is so crowded that its government felt compelled to enact its famous (or infamous, depending on one’s point of view) one child per family policy. The mission of CAPS is to prevent such an occurrence here in California and in the United States. California already contains the three most densely populated urban areas in the USA: Los Angeles, San Francisco/Oakland, and San Jose. It is no wonder that traffic and congestion in Los Angeles where I live is so overwhelming. This was definitely not the case in 1971 during my first exposure to L.A. Then the population was smaller by a million persons, and one could actually drive from the ocean to Pasadena during a weekday. Now such a trip is to be avoided if at all possible. By this is meant the preferential location of sources of pollution in and near places where poor people and persons of color live and work. To accommodate newcomers of limited financial means, Los Angeles must continuously build new “affordable housing” (i.e., low cost residential units) and find places to site such new housing. Los Angeles has very little open space, so the city’s urban planners have been forced to put affordable housing units in unhealthy places, such as alongside of freeways. Studies have shown that living within hundreds of yards of freeways is unhealthful, especially for children – but if the choice is to not build the affordable housing or to put it alongside freeways, the planners choose the latter. This is a clear example of how population growth drives environmental injustice. Population growth can be caused by an imbalance between fertility and deaths or between immigration and emigration, or both. (Increasing human lifespans is another cause of population growth.) In recent decades California’s population growth has been due almost entirely to immigrants arriving from other countries and their U.S. born offspring. As we all anticipate, changes in federal government policies between the Obama and Trump administrations will likely be dramatic. Such changes will surely manifest themselves in part in federal actions and laws that relate to U.S. fertility and immigration. CAPS will endeavor to keep pace with the changing political landscape by appropriately modifying our specific focus and efforts. Please let us know should you have any opinions as to how this might best be accomplished as the policies of the new administration unfold. For years, the press helped blur the distinction between American citizens and those who staked a claim to live in the U.S. without any legal authority. However, with a new administration committed to ending egregious violations of American immigration law, it’s increasingly difficult for corporate-run press to not at least give one soundbite or quote in the name of fair and balanced reporting. CAPS is taking advantage of this window of media opportunity in 2017. We ran TV and radio ads in Arizona asking if Sen. Jeff Flake is really ready to work with President Trump on immigration since Sen. Flake has sponsored an amnesty bill and been against minimum sentences for illegal aliens who are deported and re-enter the U.S. So far this year, such ads and other outreach have brought an increased number of media calls to CAPS, which has fielded questions from CBS Radio, NPR Public Radio, KEYT, KCOY, KKFX TV, Laura Ingraham’s LifeZette, The New York Times, USA Today, The Daily Caller, Arizona Central, and Mongabay, along with California outlets, including the Los Angeles Times, The Mercury News, The Santa Barbara Independent, Ventura Country Star and Orange County Register, among other print and broadcast outlets. Guzzardi said in talking with media he also noticed a general understanding of CAPS’ logical arguments for reduced immigration and refugee resettlement in safe zones abroad. In addition to responding directly to media requests, CAPS produces commentaries for media. Guzzardi’s insightful and timely analysis focuses on issues that concern CAPS and its members. 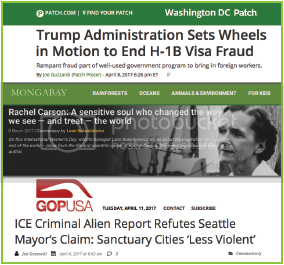 Through CAPS distribution and the Cagle news syndicate, numerous daily newspapers nationwide publish Guzzardi’s editorials, and they consistently appear in GOPUSA, Santa Barbara’s Noozhawk and the Washington, D.C. Patch. So far in 2017, Guzzardi has penned several dozen commentaries covering President Trump’s actions and executive orders on immigration and refugee issues (along with lack of action on issues such as DACA), U.S.-Mexico relations in a Trump world, the shift in law enforcement in Arizona with the exit of outspoken Maricopa County Sheriff Joe Arpaio, immigration protests and sanctuary cities. CAPS also offers analysis on issues related to the environment and overpopulation. Because population growth in recent years has been directly driven by immigration, CAPS has focused on this element. But CAPS was formed 30 years ago, during the period of the Zero Population Growth movement and heightened awareness of environmental degradation. Our core mission continues to be advancing policies and programs designed to stabilize population to preserve the environment and a good quality of life for all. So we try to balance our media outreach with material that talks about all of these issues. Examples from 2017 include a look at the mixed and vulnerable environmental legacy of the Obama administration written by CAPS Advisory Board Member and Writing Fellow Leon Kolankiewicz. This commentary was picked up in January by multiple newspapers, including several that are part of the USA Today Network. In February, Mongabay, a respected news outlet for environmental science and conservation information, ran Kolankiewicz’s article on distinguished Harvard biologist E.O. Wilson, who advocates for preserving half the planet in an undisturbed, natural condition in order to save nonhuman life that is being wiped out at alarming rates. In March, Mongabay also published Kolankiewicz’s piece on Rachel Carson, author of the iconic “Silent Spring,” named one of the 25 greatest science books of all time by Discover Magazine. You can find all of the content produced by CAPS writers at CAPSweb.org. Opinion releases are located under the “Press” section on the navigation bar at the top of the homepage. Overpopulation-related problems in California and the United States continue to be the focus of the educational and media work of CAPS. With multi-year drought in the Southwest, CAPS had a very real example of the demands from growth intersecting with natural resources and climate change, and talked about this in our outreach efforts. In 2016, CAPS worked to inform the public, elected officials and the media about the destructive results of rampant population growth primarily driven by massive legal and unchecked illegal immigration. We discussed economic and job-related issues, security and employment issues, compromised environment, biodiversity loss, weakened infrastructure, stressed educational systems, heightened security concerns and diminished quality of life. CAPS reiterated its belief that the United States needs a population policy that limits the overall numbers of immigrants legally admitted, eliminates illegal immigration and supports family planning. Throughout the year, our messaging reinforced these ideas. In April, we converted our impactful Earth Day TV ad to a radio ad. We again utilized our ad featuring a child asking questions about California’s growth. The ad suggests that California should implement policies to slow immigration in order to slow population growth, given the negative impact on water, natural resources, the environment and quality of life for future generations. CAPS then continued attacking national sanctuary policies, raising public awareness and passion for the issue, as well as directly pressuring decision-makers. A hard-hitting video was created for social media. It opened with then San Francisco Sheriff Mirkarimi and his infamous defense of sanctuary policies in the wake of Kate Steinle’s murder by an illegal alien which caused him to lose re-election. CAPS video targeted Facebook and Twitter fans and followers of presidential candidates. This proved successful, resulting in more than 623,000 video views on Facebook and 7,628 video views on Twitter in just one week. The video drove viewers to a landing page, where activists could share the video with their networks and join CAPS. 474 sanctuary jurisdiction officials. By appealing to a mixture of common sense and the clear majority of public opinion, we were successful in getting some sheriffs to clarify their positions on sanctuaries and, in many cases, vocalize their commitment to enforcing immigration law. 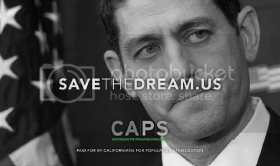 In May and June we ran TV spots in Wisconsin featuring Civil Rights leader and former Executive Director of the Congressional Black Caucus Foundation, Dr. Frank Morris, Jr., reminding Speaker Paul Ryan that it’s not racist to put Americans’ jobs first. The ad encouraged Speaker Ryan to stand up for working-class Americans instead of continuing his push for more foreign workers, more immigration and amnesty for illegal aliens. The ad concluded that slowing mass immigration and the flow of foreign workers so working-class Americans have a better chance at good paying jobs is simple common sense. Subsequently, we repurposed the ad for radio and ran the spot on several Los Angeles area stations, including traditionally African-American stations. We also adapted the TV spot and ran it in prime time on CNN during the Republican National convention on the night that Donald Trump gave his acceptance speech. The ad was seen by 2.5 to 3 million viewers. CAPS also produced a campaign related to the Middle East migrant crisis. 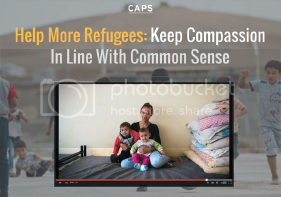 HelpMoreRefugees.com asked for viewers to keep compassion in line with common sense, proposing that efforts be made to help more refugees closer to their homes in stable areas of the Middle East, instead of bringing a select few to the U.S. CAPS Misguided Compassion social media campaign, launched in March, engaged 100,000 people in the first five weeks. Supporters were encouraged to contact President Obama and tell him to keep compassion in line with common sense. Resettling a Middle Eastern refugee in the U.S. costs 12 times more for a five-year period than sheltering that person closer to home. The campaign also emphasized that resettling refugees closer to home allows them to be in a better position to return home and rebuild their societies when it is safe to do so. Meeting the crisis at the source allows Americans to help, while also addressing legitimate safety and security concerns about admitting thousands of refugees to the U.S. who cannot be properly vetted. In June, at the FAIR-sponsored Feet to the Fire event, CAPS National Media Director Joe Guzzardi was joined on “radio row” by U.S. Senators and Representatives, sheriffs, border patrol officials and ranchers for a series of 22 interviews broadcast in the major media markets of New York, Los Angeles, Washington, D.C., Richmond, Boston, Portland and several other cities. 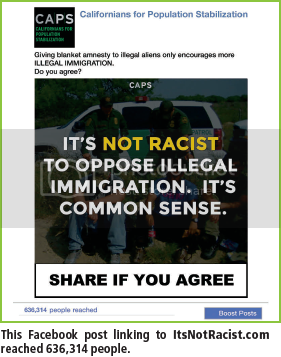 CAPS launched media materials in September, including videos and pre-roll advertising, to counter the charge that working to fight mass immigration is racist. We believe that brow-beating Americans who care about their communities and environment into feeling ashamed for wanting less mass immigration is completely unacceptable. We reached more than a million people on social media and pre-roll through itsnotracist.com with an accompanying video. This very successful campaign also aired on foxnews.com and reached more than 1 million viewers. CAPS again provided informational materials, including hundreds of books on population and population-environment issues, to Scientists and Environmentalists for Population Stabilization (SEPS) for booths at annual meetings of environmental scientific societies in the U.S and Earth Day events throughout the U.S.
High school students across the country were asked to create a video to address increasing problems caused by overpopulation and to offer solutions. Zach Letson won the first place $3,000 prize for “Breaking Point,” Jessica Stossel $1,500 for “Trapped in a Box,” and GoPro cameras were awarded to Garrett Kukier for “Abundance” and Isabelle Yang for “Overpopulated.” See the winning entries viewable at CAPSweb.org/growing-pains-video-contest-winners. CAPS became a primary plaintiff, one of nine, in a lawsuit brought by the Immigration Reform Law Institute (IRLI), and filed in the U.S. District Court in San Diego, charging the Department of Homeland Security (DHS) with disregarding the National Environmental Protection Act (NEPA) when making decisions about our nation’s immigration policies. We asked that DHS follow the laws of transparency that other agencies must follow. CAPS engaged in advocacy programs to influence elected leadership in California and at the federal level. Our 157,543 advocates were busy phoning, emailing and faxing elected officials. Meanwhile, the special interests behind massive immigration increases continued to tap into a virtually unlimited supply of funds to push their agenda. In California, the Legislature continued its efforts to dissolve the distinctions between citizens and noncitizens and between those who follow our laws and those who break them. In the face of a serious multi-year drought, our members urged Gov. Brown to stop supporting the population growth that exacerbates these shortages. Our members contacted Gov. Brown and state legislators asking that they not support legislation funding scholarships, loan forgiveness and access to the state’s health care exchange for people illegally here. They also spoke out against legislation that would impose road blocks to stopping California from becoming a sanctuary state. On the national stage, CAPS was active in continuing to help defend American jobs from cheap foreign replacement labor, to penalize visa overstays, work to discourage the influx of unaccompanied minors at the southern border, and tax the $54 billion in wire transfer remittances sent by illegal aliens to other countries. Our members also asked that Congress assert control over U.S. refugee policies. Further, CAPS activists urged President-elect Donald Trump to work to effect enforcement of immigration laws and the reduction of both legal and illegal immigration. CAPS Board member Michael Rivera was successful in encouraging the Paso Robles, California City Council to adopt a formal program to use E-Verify for hiring city employees, with the intention that this success will serve as a prototype for other jurisdictions. A donor survey for CAPS showed that more than 70 percent of respondents think the organization is making a lot of impact, or a moderate impact, on solving immigration-driven population and environmental problems. CAPS coordinated several talks for college students, with Ben Zuckerman, CAPS Vice President and Professor Emeritus of Physics and Astronomy, and Research Professor at UCLA, speaking on “Population Consumption, Overshoot.” Only through population stabilization can we sustain Earth, Dr. Zuckerman explained. Ric Oberlink, J.D., Senior Writing Fellow and former CAPS Executive Director, debated at the Santa Barbara County Bar Association Bench and Bar Conference on “The State of Immigration Law and Efforts to Reform and Enforce It.” Additionally, CAPS National Media Director Joe Guzzardi traveled the U.S.-Canadian border with a Center for Immigration Studies-sponsored trip that covered nearly 1,000 miles, meeting with border patrol agents, the former Canadian ambassador and other dignitaries, all lamenting problems such as vulnerability, crime, trafficking, desperation and exploitation. CAPS welcomed Michael Rivera, a fifthgeneration Hispanic-American, as a new member of its board of directors in 2016 and Dr. Frank Morris, Sr. to its advisory board. Mr. Rivera has a long-time commitment to addressing the impacts of illegal immigration and has advocated the use of E-Verify by local municipalities and governments. He has served on numerous boards and commissions, including the Santa Maria Recreation and Parks, County of Santa Barbara Private Industry Council and City of Guadalupe, and committees, including the Mayor’s Housing Task Force. CAPS continued to provide daily updates on news related to our issues and provide fresh commentary from our writers. We also expanded our Facebook and Twitter advertising campaigns to educate and grow our base. The number of unique visitors to our website, CAPSweb.org, and total page views continued to grow as more and more people linked back from Facebook and Twitter posts to CAPS blogs and media coverage. 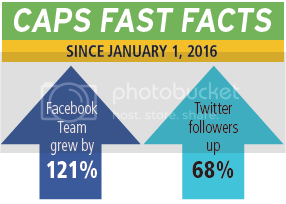 In 2016 Facebook drove approximately 45 percent of total traffic to CAPSweb.org. The website received 139,698 visitors, 63,244 from Facebook. We also developed new related websites so that people searching for the core issues that CAPS addresses would find additional positive, well-reasoned explanations to augment our main website, including savejobsforamericans.com, Californians-stabilize-population.org and race-to-immigration-sustainability.org. We continued a Facebook advertising campaign to educate and grow our Facebook fan base and increased our number of fans from the beginning of the year from 230,155 to 510,442. Our posts reached an average of 454,521 people per week, with more than 52,269 weekly engaged users. We have also consistently increased the conversion of social media fans to CAPS activists and supporters. CAPS received thousands of signed petitions as of December 31, 2016, made available through Facebook ads. Our fellows and contributing writers were published and interviewed throughout the year by multiple news outlets, and they contributed 268 original commentaries to the CAPS blog. This content covered varied topics from analysis of the monthly jobs report and the correlation to immigration, sanctuary cities, trade, terrorism, refugees and E-Verify to the environment and the drought. In 2016, the blog had more than 114,455 visitors. As well, Claude Willey wrote “The Crush of Urbanity: Fact and Fiction,” and CAPS Fellow and Advisory Board Member Leon Kolankiewicz penned “Carrying Capacity, Populations and People,” both long evergreen pieces and available on the CAPS website home page. The contest encouraged U.S. college students to submit an essay focused on the impacts of overpopulation on the natural environment and quality of all life, and the benefits that a stabilized population would bring. The first place $1,500 winner was Hayley Darling from Mesa, Arizona; the second place $1,000 winner was Alexis Anderson from Auburn, California, and the third place $500 winner was Samantha Drew from Sussex, New Jersey. CAPS received multiple letters from students expressing their gratitude for being able to participate. For many, this was the first time they were encouraged to think about population and its consequences. Even a casual observer would notice that there has been a whirlwind of activity in the first months of the Trump administration. Within a week of the January 20 inauguration, the President issued executive orders on border wall construction and sanctuary cities. In spite of Trump’s promise to rescind the DACA amnesty, the President has yet to take action. The executive order signed by President Obama in 2012 has granted renewable two-year work permits to more than 750,000 individuals who are in the country illegally. As of this writing, the DHS website is still accepting applications for new DACA permits and renewals. President Trump signed an executive order designed to keep “radical Islamic terrorists out of the United States of America.” The order took immediate effect to bar admission to the U.S. of all people with non-immigrant or immigrant visas from seven countries for 90 days. It also barred entry to all refugees for 120 days and instituted an indefinite ban on refugees from Syria. Opponents quickly filed several legal challenges, and a week later a federal court in Washington State issued a restraining order, which was upheld by the Ninth Circuit. indefinite ban on Syrian refugees and allowed for entry of all foreigners already in possession of a valid visa. A Hawaii federal court issued a temporary restraining order that prevents the travel ban from taking effect. SB 6 - would require California to fund the legal costs of illegal aliens to fight deportations. AB 450 - would require employers to alert employees of any planned federal immigration raids, or face up to $25,000 in fines. A change in the administration is not enough to implement the immigration reductions that America needs. Powerful moneyed forces feel threatened. Google, Facebook and Apple, in addition to the ACLU, joined state efforts to overturn the executive orders. Street protests of an angry “resistance” movement have often turned violent. Legislative efforts to eliminate birthright citizenship and the visa lottery will require overcoming the Senate’s 60-vote cloture rule. Activists opposed to massive immigration must continue their engagement in order to seize this opportunity. 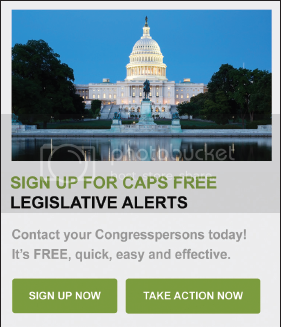 Go to the CAPS website and “Take Action” by sending the latest “Action Alerts” to your elected officials.